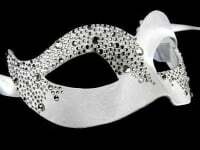 Dazzle and sparkle with this beautiful Inferno Filigree Masquerade Mask - Swarovski Edition. A must-have for everyone who loves glamour, this gorgeous mask is designed in nero black laser cut metal filigree, beautifully embellished with dazzling Swarovski crystals for ultimate femininity. A stunning touch to your look, complete your favourite evening dresses with this fabulous masquerade ball accessory. Feel the heat!